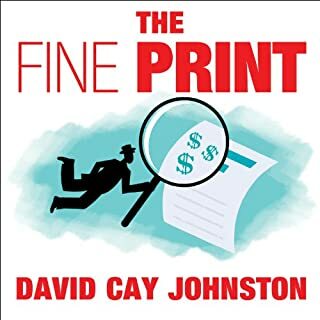 This book documents with facts and entertaining true stories how the corporate world and their high paid lobbyists have taken over our government to enrich the few at the expense of the many. For anyone who wants to know where all our money went, this is a must read! The narration makes it all the better as it is by the author himself, and he does an excellent job. I was sad when it ended and look forward to Mr Johnston's next book. If you despise welfare moms who keep having kids to leach off the government, wait til you read about these corporate welfare hogs. If you rush to vote politicians out of office when they're discovered taking extravagces at the taxpayers expense, wait til you read about famous wealthy folk who make a living using tax funds as their own bank. These many shameful scams are described with careful reference to verifiable records - newspaper reports, court filings, etc. The author even takes pains to defend some of those involved where appropriate - abasent a company culture to the contrary, corporate officers are obligated to pursue the most profitable course lest they be blamed for incompetence - small town government officials don't want to see their towns become a footnote in history. 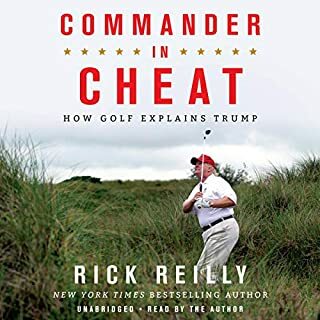 What makes this book masterful is that the author describes the scams like a journalist, as opposed to the overstated and dramatic styles that O'Reilley, Michael Moore, Limbaugh and other similar "reporters" have made fashionable. At times I found the information provided so upsetting I had to turn it off. That should be taken as an ultimate compliment, considering the subject matter. What made this so interesting throughout was that the author used many different scenarios to make his point. What our representatives have allowed to happen in tax policies, lack of oversight etc. is nothing short of criminal. If only every person in our country spent just a few hours each month listen/reading materials like this, maybe we would not all fall for the sound bites we are fed by our political representatives we would not be selling the very future of our company to the elite few. Thank you Mr. Johnston for this very illuminating read. The book chapters aren't titled and are grouped into sections that do not give any information as to what is contained into each section. It makes it impossible to go back and find anything. What made the experience of listening to Free Lunch the most enjoyable? The openess of how the author discusses tax bailouts for Corporate America. No this is not about the Oil Companies. They aren't even the biggest offenders. WalMart and Cabela's are some of the worst. I know you Right Wing Conservatives might be shocked at Cabela's being on this list. But they have made an art out of demanding tax breaks from the Federal Gov't down to the local city or county agencies. We hear the politician keep blowing hot air about people on welfare. Yet not once have I heard one of them complain about the ongoing Tax Welfare for the Mega Corporations. If more people were to read or listen to this book then maybe would could get the politicians to do something about it. I recommend this book to anyone that is interested in wasteful Gov't spending! It eye opening and all revealing. If you could give Free Lunch a new subtitle, what would it be? It skips its not the full c book can't use it needed it for school. No one. My political and economic views are very similar to the author, So the subject matter was not a problem. 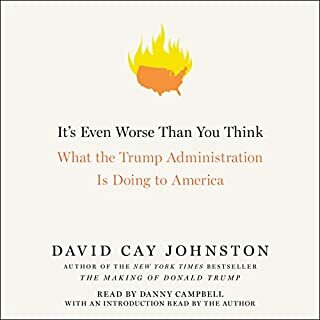 What could David Cay Johnston have done to make this a more enjoyable book for you? Completely rewrite it. 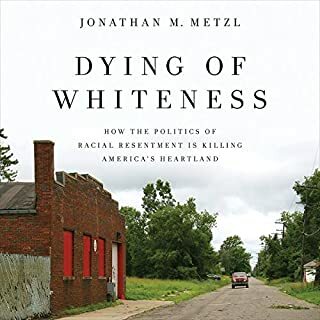 I am very interested in the subject matter proposed but was extremely surprised to see that the book consisted of rhetoric combined with a few short stories in order to elucidate his subject matter.There was no real content to the book. 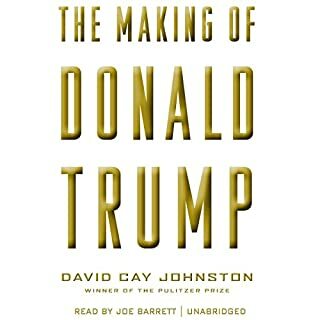 What aspect of David Cay Johnston’s performance would you have changed? Not really. It was extremely undeveloped And the content was illusory. I knew that this was a very short book going in. Because of the ratings I expected some real content but found very little. 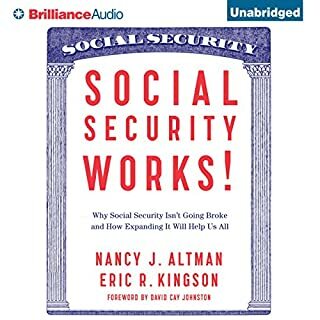 I can only surmise that,once someone purchases an audiobook, they feel they must give it a high rating.My review is intended to warn others to take the ratings for this book with a huge grain of salt. That old commercial, "where's the beef" is applicable here. I guess I'm the gullible one to purchase a 6hr. and 20 minute audiobook and think it could be long enough for the author to develop his premise. Alternatively, the inflated ratings ascribed to audiobooks are becoming deceptive. Buyer beware. What did you like best about Free Lunch? What did you like least? 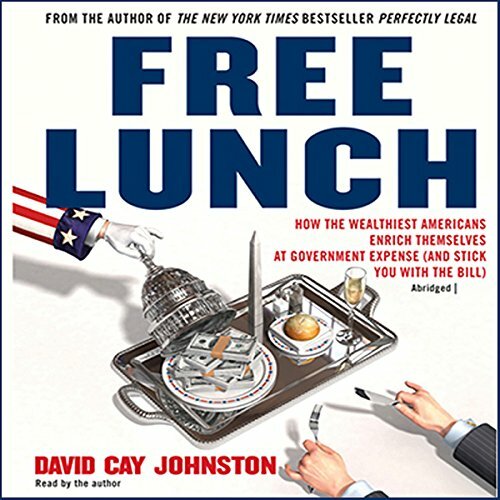 What other book might you compare Free Lunch to and why? I bought this book thinking that it would provide tips and tricks on how to save money from taxes and such. However it was the total opposite. It was a book that talked about how well connected individuals use tax money to make themselves richer! Well I already new these kind of things happen, it's not new. I was hoping I could learn some ways to do the same thing. I bought this book with the wrong assumptions, and therefore didn't like it. For me it was a long winded book complaining about how the rich and well connected continue to get richer. My attitude is, quit complaining, if we invest the amount of time we complain about the rich, and put that time in learning how to think and become wealthy, we all would be in a better place.